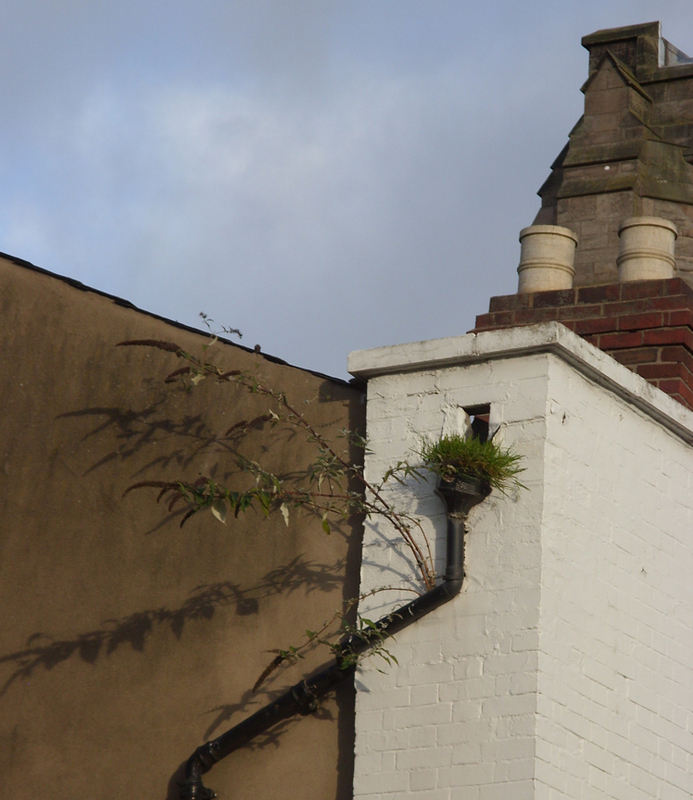 At the end of November 2013, I decided to take my camera into the City of Hereford. It was a short scamper through the crowds, so this is a brief snapshot of the delights Hereford has to offer. We start our journey at the junction between two well known supermarkets. The path into town has these lovely trees laden with red berries. I believe they are mountain ash, or rowan trees. 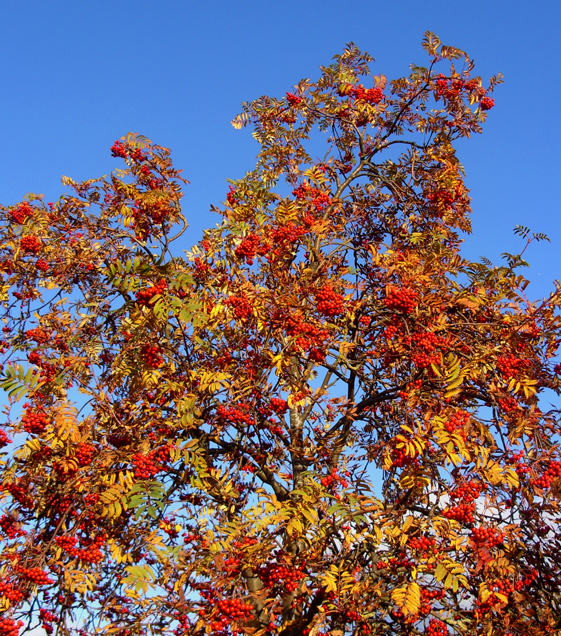 The old English name for rowan was cwic-beam, which became translated somehow into witch tree and so they are associated with Wicca. In the classic film, “The Wicker Man” starring Edward Woodward the name of the pagan child he seeks is Rowan. Apparently druids use rowan wood to make their wands. On a more pragmatic level, these trees provide sustenance for moths and birds. We are approaching Hereford from the west, to an area called Eign Gate. In medieval times there was a gated wall around the city. There are still small sections of wall standing but the Eign Gate itself was demolished in 1787. 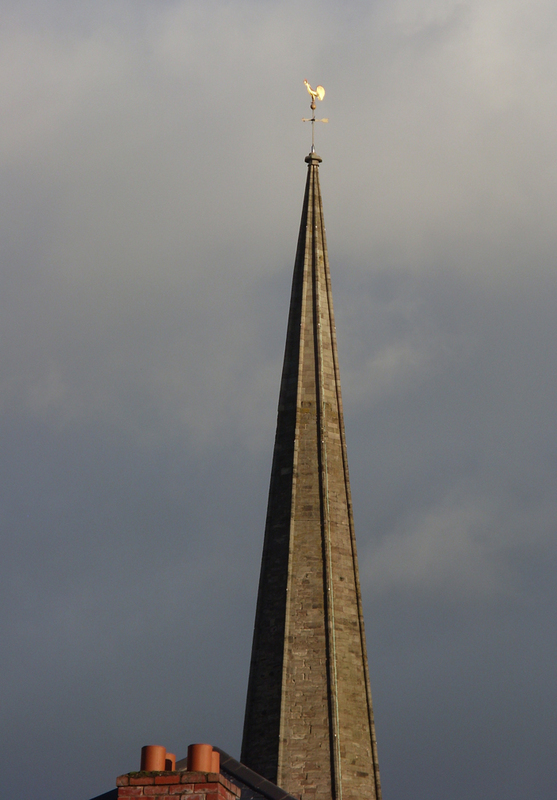 The most prominent landmark is the spire of All Saints Church, a medieval building in the Norman style. It is topped by a magnificent weathercock, made of copper with glass eyes, it is five feet long and four feet tall. It was taken down for re-gilding in 2007 and found to have bullet marks all over it! It certainly catches the sun beautifully. 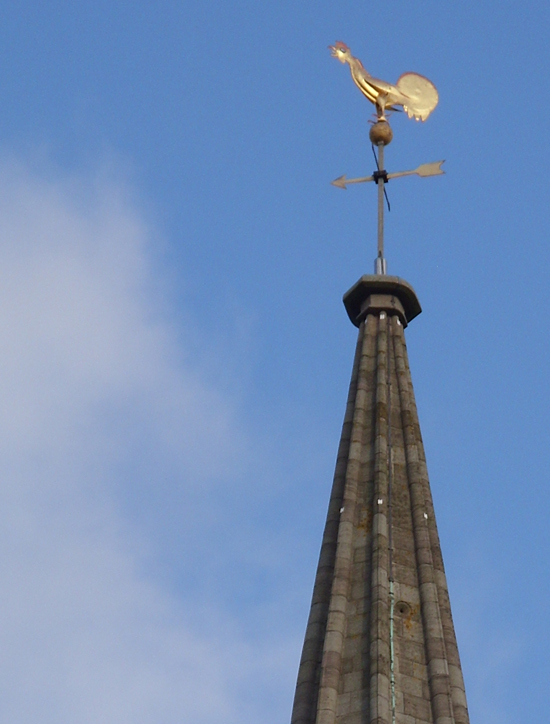 The word weathervane comes from “weather” and the old English word “fane”, meaning flag. The Greeks and Vikings both used symbolic animals which rotated atop buildings to indicate wind direction. A ninth century papal edict decreed that all churches should display a cockerel as a reminder of Peter betraying Christ three times before a cockerel would crow. The two concepts combined to create the weathercock. Looking upwards as we pass through Eign Gate, one can appreciate the Herefordian’s love of plants; we even grow them in our guttering! In the centre of Hereford is High Town. 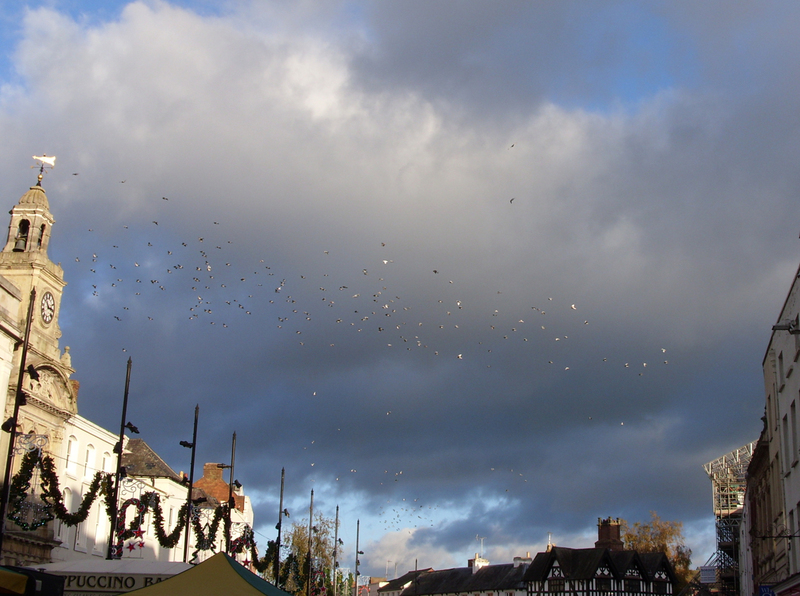 Our resident flock of pigeons is airborne and catching the low November sun beautifully. Unlike the flock of pigeons that frequent my garden bird table, these city slickers seem to have a lot of deformed or missing feet. I don’t know if it is down to disease, genetic mutations or if they are injuring themselves. In recent years they have been facing stiff competition for scraps from an influx of gulls. They are heading for the ornate clock tower of the Buttermarket on the left of the photo. The Buttermarket is a Grade II listed building dating from 1860. As the name suggests it used to be a market place for dairy produce such as butter and cheese. Now it hosts a variety of stalls, for instance you can buy your fish supper whilst waiting to have your keys cut. 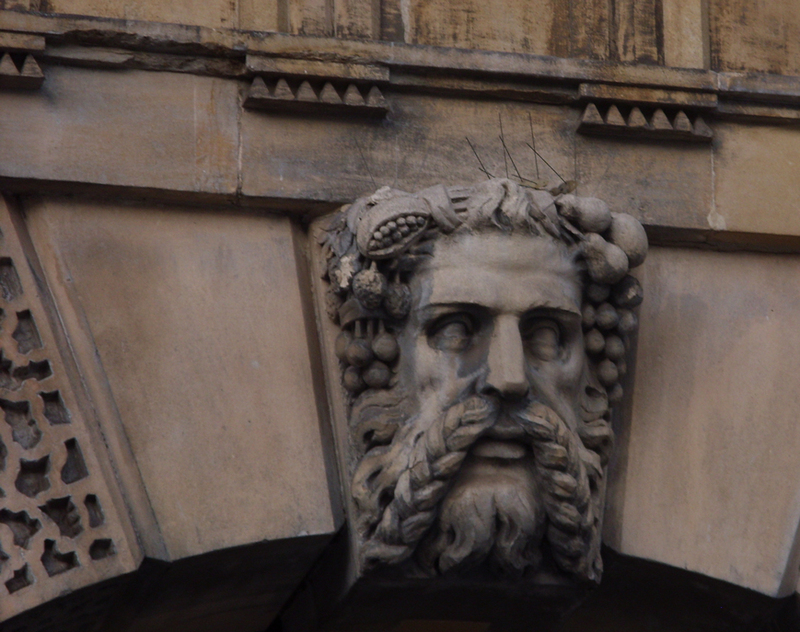 I am rather taken with this sculpture above the entrance, it is not quite a Green Man or Foliate Head, but it is close. Now we come to an old house, imaginatively called The Old House. 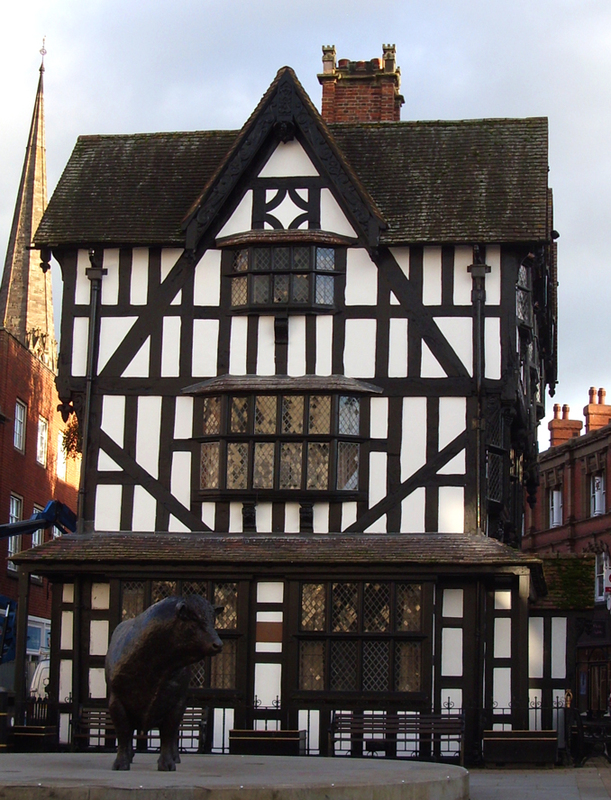 It is a Jacobean half-timbered black and white house dating from 1621. It was part of Butchers’ Row, the rest of which was demolished in 1816. It was turned into a museum in 1929. The sculpture in front of The Old House is a recent addition to the city. 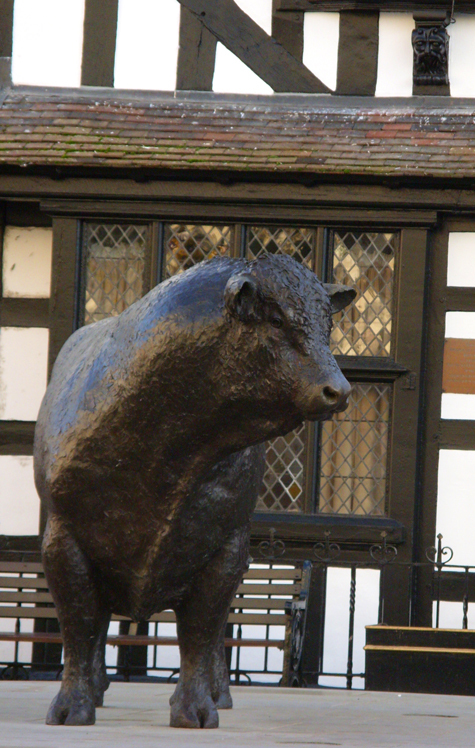 It is a life sized bronze statue of a Hereford bull by Brian Alabaster. Many local people felt that it should have been coloured in the distinctive brown and white. Personally I felt that it should have had it’s horns intact, but perhaps that was a health and safety issue. Film fans will know the cattle from the James Stewart film The Rare Breed about a Hereford bull called Vindicator. I hope that you have enjoyed part one, stay tuned for part two of this urban bimble, in which we head for the river and meet a famous composer. This entry was tagged buttermarket, Hereford, Hereford Bull sculpture, mountain ash, pigeons, rowan, The Old House, weathercock. Bookmark the permalink. We had a Hereford bull on the farm when I was younger. That one was called Adam. Thanks for the confirmation, I have no confidence with tree id!